Lymphangioleiomyomatosis is a rare, progressive cystic lung disorder characterised by dysregulated activation of mammalian target of rapamycin (mTOR) signalling. This was a phase IIa, multicentre, open-label study of the mTOR inhibitor everolimus (2.5 mg·day−1 escalated to 10 mg·day−1) in 24 women with lymphangioleiomyomatosis. Primary endpoints were safety, pharmacokinetics and serum vascular endothelial growth factor-D (VEGF-D) levels; secondary endpoints were measures of lung function. Following 26 weeks of everolimus treatment, forced vital capacity exhibited stability, while forced expiration volume in 1 s improved from baseline, with mean changes (95% confidence interval) of 10 mL (−111–132) and 114 mL (11–217), respectively; 6-min walk distance improved by 47 m. Median VEGF-D and collagen IV levels decreased from baseline, from 1730 pg·mL−1 to 934.5 pg·mL−1, and 103 ng·mL−1 to 80.5 ng·mL−1, respectively. Adverse events were mostly grade 1−2; mouth ulceration, headache, nausea, stomatitis and fatigue were common. Serious adverse events suspected to be treatment related included peripheral oedema, pneumonia, cardiac failure and Pneumocystis jirovecii infection. Everolimus blood levels increased dose proportionally. In this study, everolimus improved some measures of lung function and exercise capacity and reduced serum VEGF-D and collagen IV. Side effects were generally consistent with known toxicities of mTOR inhibitors, although some were severe. Lymphangioleiomyomatosis (LAM) is a rare, progressive cystic lung disorder [1–6] that occurs either as a manifestation of tuberous sclerosis complex (TSC-associated LAM) or in the absence of TSC (sporadic LAM) [6, 7]. LAM occurs in both men and women, but symptomatic LAM is almost exclusively restricted to females [3, 4, 6, 8–10]. LAM is caused by infiltration of smooth muscle-like cells typically exhibiting mutations of TSC2 [11, 12] and is associated with dysregulation of mammalian target of rapamycin complex (mTORC) signalling, which results in inappropriate cell growth, survival, and movement . Overexpression of vascular endothelial growth factor-D (VEGF-D) has been demonstrated in patients with LAM [14, 15], and has been proposed as a useful diagnostic tool  and a biomarker of disease severity and treatment response . Clinical manifestations of LAM include dyspnoea, spontaneous pneumothorax, chylous pleural effusion and cystic destruction of the lung that may progress to chronic respiratory failure [1, 3, 4, 6, 18–20]. Lung function declines at 3–5 times the rate seen in healthy subjects [2, 21, 22]. Clinically important respiratory impairment develops in most patients within a decade after onset of symptoms  and the rate of progression is variable; most patients survive 10−20 years or more after diagnosis [3, 20]. Until recently, management of LAM was primarily supportive, with hormonal therapy and doxycycline showing lack of efficacy [13, 23, 24], but mTOR inhibitors have changed the treatment landscape. The double-blind, placebo-controlled MILES (Multicenter International Lymphangioleiomyomatosis Efficacy and Safety of Sirolimus) study, which evaluated sirolimus in patients with LAM and abnormal lung function, demonstrated improved or stabilised lung function and improved functional performance and quality of life (QOL) . Improvements in angiomyolipoma volume and improvement or stabilisation of lung function have also been demonstrated with sirolimus in open-label trials of patients with renal angiomyolipoma due to TSC or LAM [26, 27]. Efficacy and safety of everolimus in the treatment of angiomyolipoma were confirmed in the randomised, double-blind, placebo-controlled, phase III EXIST-2 (Examining Everolimus in a Study of Tuberous Sclerosis Complex) study, which examined patients with TSC or sporadic LAM . Lung function deteriorated slightly less in patients treated with everolimus than in those receiving placebo, but conclusions based on findings from this exploratory EXIST-2 endpoint are limited by the short duration of treatment exposure and low number of patients with sporadic LAM. In the current study, the pharmacodynamics, pharmacokinetics, efficacy and safety of everolimus in women with LAM were assessed in an open-label phase II trial. Efficacy biomarkers including lung function and high-resolution computed tomography (HRCT) imaging were also included as secondary and exploratory endpoints. The study was a phase IIa, multicentre, open-label, nonrandomised, within-patient multiple dose-escalation trial. The study protocol was reviewed by the Independent Ethics Committee or Institutional Review Board at each centre and conducted according to the principles of the Declaration of Helsinki. All patients provided written informed consent and the trial was registered with ClinicalTrial.gov (NCT01059318). Eligible patients were women aged ≥18 years with a diagnosis of LAM (sporadic or TSC-associated) confirmed via chest HRCT scan and lung biopsy or with chest HRCT scan findings compatible with LAM plus renal angiomyolipomata, chylous pleural or abdominal collection, abdominal/pelvic lymphadenopathy or lymphangioleiomyomas, clinical syndrome compatible with an established genetic diagnosis of TSC, or serum VEGF-D >800 pg·mL−1. Patients also had pulmonary function abnormalities defined as forced expiratory volume in 1 s (FEV1) ≤80% of the predicted value following administration of a standard dose of a short-acting β2-agonist (salbutamol 200 µg) or FEV1 <90% of the predicted value postbronchodilator and uncorrected diffusing capacity of the lung for carbon monoxide (DLCO) <80% of the predicted value. Women of childbearing potential had to take adequate precautions against pregnancy during the study and for up to 8 weeks after the last dose of study drug. Exclusion criteria were WHO class IV functional status, FEV1 <30% of predicted postbronchodilator, change in forced vital capacity (FVC) of more or less than 15% of screening value at baseline visit, use of sirolimus or any oestrogen-containing medicine within 4 months prior to screening or during the study, or use of an investigational drug within 30 days prior to screening. Also excluded were patients listed for lung transplantation or who had previously received lung transplantation, had any type of pleural disease severe enough to affect pulmonary function, had a history of acute pneumothorax or chylothorax within 2 months of screening, had significant haematological or hepatic laboratory abnormalities, or were pregnant or breastfeeding. Following a 28-day screening period, patients received everolimus 2.5 mg·day−1 for 4 weeks, followed by dose titration (based on safety and tolerability) to 5 mg·day−1 for 4 weeks then 10 mg·day−1 for 18 weeks thereafter. A single tablet was taken orally at the same time each day with a glass of water. The criteria for downward dose adjustment were unacceptable tolerability, Common Terminology Criteria (CTC) grade 3–4 clinical adverse event possibly or likely due to everolimus, confirmed grade 3−4 laboratory abnormalities or grade ≥2 pneumonitis or grade 1 pneumonitis with radiological evidence of worsening. Study medication was discontinued if any of the above criteria occurred during the first 2 weeks of receiving everolimus. Special attention was paid to the risk of everolimus-induced pneumonitis, with a high-priority reporting and management plan. In the event of safety concerns at the higher dose levels, dosing ceased for up to 2 weeks and was resumed at a lower dose level, with escalation as tolerated up to 10 mg·day−1 after an additional 2 weeks. Patients were withdrawn from the study if any of the above criteria persisted for 2 weeks after dosing cessation and/or reduction or down-titration; in the event of hypersensitivity to everolimus, grade 4 non-infectious pneumonitis, or recurrent grade ≤3 pneumonitis; or at the request of the patient. There was an optional extension period for patients completing 26 weeks of treatment (up to 62 weeks), and the final follow-up visit was 4−8 weeks after the last dose of study drug. Compliance was monitored by pill counts between visits. Primary endpoints of the study were safety and tolerability, and pharmacokinetics and pharmacodynamics (serum VEGF-D) measures. Secondary efficacy variables included mean change from baseline in measures of FVC, FEV1, total lung capacity (TLC), DLCO and 6-min walk distance (6-MWD). Patients were assessed every 4 weeks during the dose-adjustment phase, every 2−3 months when a stable dose of 10 mg·day−1 was achieved, then monthly during the extension phase. Spirometry was performed to determine FVC and FEV1, and extended pulmonary function testing was done using whole-body plethysmography for TLC, DLCO, a standardised 6-MWD, and blood oxygen saturation. Spirometry evaluation followed the recommendations of the American Thoracic Society (ATS)/European Respiratory Society (ERS) Task Force Standardisation on Lung Function Testing . Serum VEGF-D levels were determined using a single ELISA at baseline and at weeks 4, 8, 14, and 26. Other biomarkers, also measured using ELISA, were markers of tissue destruction (collagen IV) and potential markers of LAM disease (osteopontin) in blood. Adverse events were coded according to Medical Dictionary for Regulatory Activities terminology. Adverse events and serious adverse events, including severity and relationship to study drug were recorded at each visit. Haematology, blood chemistry, electrocardiography (ECG) and urine were monitored along with vital signs and physical condition. Chest radiography was performed at screening and at week 14, and HRCT was performed at baseline and at week 26. Radiographs and HRCT images were reviewed by an independent, blinded radiologist to identify changes from baseline that were consistent with pneumonitis and that may indicate the presence of subclinical pneumonitis. Magnetic resonance imaging was obtained at baseline, week 26 and week 50 to assess the presence of angiomyolipoma. Everolimus concentrations were determined in whole blood, using liquid chromatography with tandem mass spectrometry (lower limit of quantification 0.3 ng·mL−1), at predose (trough levels) and at 2 h postdose (peak levels) at weeks 4, 8, 14 and 26. Sample size was calculated based on the precision in the estimates of mean everolimus trough levels and the power to detect changes from baseline in serum VEGF-D levels. Assuming a dropout rate of about 30%, 24 enrolled patients were required to ensure that 16 patients were available for the week 26 assessments. With an assumed coefficient of variation of everolimus trough levels of 75% (based on 50%–100% observed in previous studies) and 16 patients, a two-sided 95% confidence interval (CI) would range from 72% to 139% of the estimated mean trough level. Also, with an assumed coefficient of variation of intraindividual post- or pre-treatment VEGF-D ratios of ≤100%, 16 patients provided approximately 88% power to detect a two-fold change in VEGF-D levels compared with baseline (2-sided test at 5% alpha level). The safety analysis set comprised all patients who received study drug, and the pharmacokinetics and pharmacodynamics analysis sets comprised all patients with no major protocol deviations affecting pharmacokinetics and pharmacodynamics. There was no imputation of missing data. Summary statistics were provided for all results variables and 95% CIs were calculated for mean pharmacokinetics and pharmacodynamics endpoints. The relationship between VEGF-D and collagen IV levels and lung function at week 26 were explored graphically and with correlation coefficients. All statistical analyses were performed using SAS version 9.2 (SAS Institute Inc, Cary, NC, USA). The study was conducted from January 24, 2010, to June 16, 2012. 24 female patients with a median age of 42.5 years (range, 18–69) (table 1) were enrolled from two centres in the USA (n=9), one in France (n=7) and one in Italy (n=8). 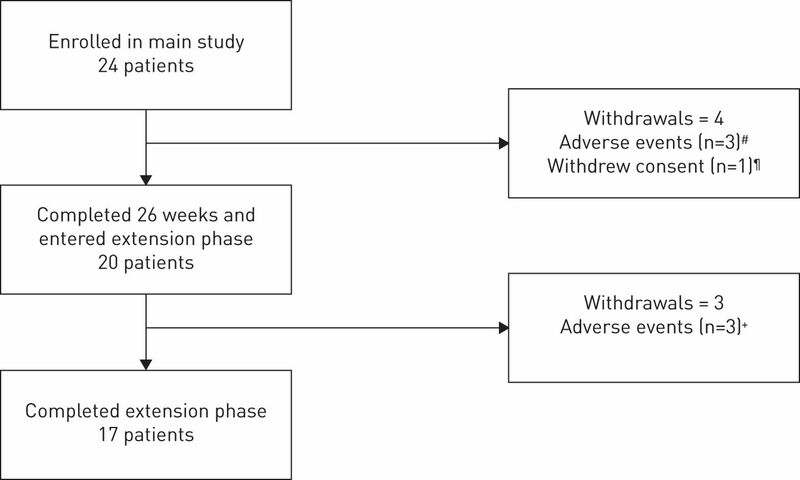 Patient disposition and reasons for withdrawal are shown in figure 1. Patient disposition. #: one patient withdrew due to a serious adverse event (grade 2 peripheral oedema), which was suspected to be related to study drug and resolved with treatment with furosemide after the patient discontinued everolimus. Two patients withdrew due to two nonserious adverse events, one of which was suspected to be related to the study drug (grade 2 menometrorrhagia). The other patient had low serum phosphorus (grade 1) at screening, the baseline visit, and during the course of the study which was not felt to be treatment related. ¶: one patient withdrew consent to pursue lung transplant. +: three patients withdrew due to four nonserious adverse events. One patient experienced grade 1 noncardiac chest pain and increased oxygen requirement that was not suspected to be related to the study drug. Another patient developed bilateral, non-specific interstitial changes on high-resolution chest tomography which were suspected to be related to study drug. The third patient experienced increased γ-glutamyl transpeptidase blood levels which were suspected to be related to the study drug. Efficacy data were analysed based on the pharmacodynamics analysis set (n=24). Stability of FVC and improvement in FEV1 compared with baseline values was demonstrated with everolimus (fig. 2). FVC and FEV1 generally increased throughout the treatment period up to week 50. After 26 weeks on treatment, the mean change in FVC from baseline was 10 mL (95% CI −111–132) and there was a 114-mL (95% CI 11–217) improvement in FEV1. The largest increases in FVC were observed during the extension phase of the study; however, the number of patients in the extension phase was small and declined with time. 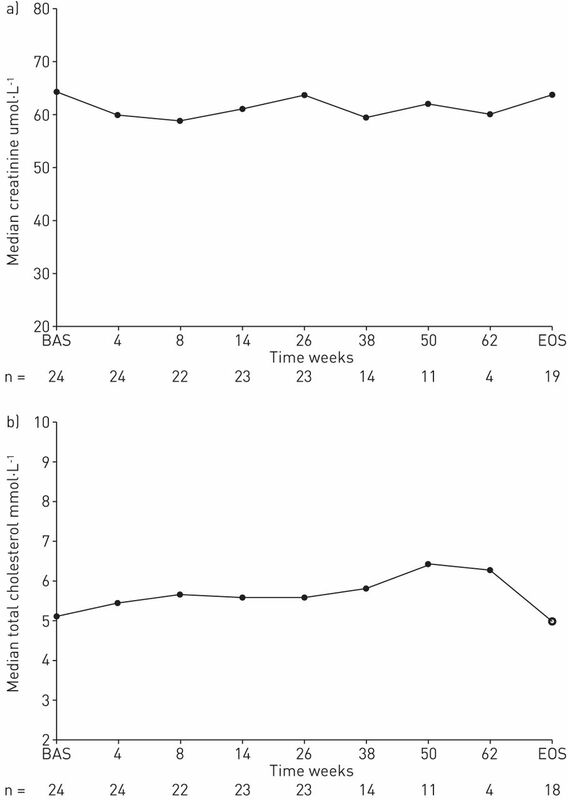 Mean±sem change from baseline (BAS) in a) forced vital capacity (FVC), and b) forced expiratory volume in 1 s (FEV1) during 62 weeks of treatment with everolimus (pharmacodynamic analysis set). Filled circles represent the 26-week treatment period; open circles represent the optional extension period. EOS: end of study. The 6-MWD increased from a mean±sd of 436.4±143.7 m at baseline to 486.2±128.4 m at week 14 and 489.1±122.8 m at week 26, indicating respective mean increases of 44 m (95% CI, 10.7–77.3) and 47 m (95% CI −3.0–97.0). All 24 patients were evaluable for pharmacodynamics. Median levels of serum VEGF-D declined from 1730 pg·mL−1 at baseline to 935 pg·mL−1 over the treatment period, with an overall median reduction of 937 pg·mL−1 at week 26 (figs 3 and 4a). No relationship was observed between the change from baseline in VEGF-D and changes in lung function (FVC, FEV1). Collagen IV levels also decreased with everolimus treatment from a median baseline of 103.0 ng·mL−1 to 80.5 ng·mL−1 at week 26 (fig. 4b); there was no correlation with changes from baseline in lung function. Osteopontin levels increased throughout the treatment period (fig. 4c). Median (interquartile range) change from baseline (BAS) in serum levels of vascular endothelial growth factor-D (VEGF-D) (pharmacodynamic analysis set). Median (interquartile range) blood levels of a) vascular endothelial growth factor-D (VEGF-D), b) collagen IV, and c) osteopontin during 26 weeks of treatment with everolimus (pharmacodynamic analysis set). Tolerability was assessed in the safety analysis set (n=24). The majority of patients (n=22) received everolimus 2.5 and 5 mg for 4 weeks each and 10 mg for between 5 and 62 weeks. Two patients received everolimus 2.5 mg for 2 weeks, 5 mg for 3−4 weeks, and 10 mg between 4 and 33 weeks. Medication compliance was good (only two patients did not have 100% compliance). Adverse events were mostly grade 1−2 in severity; approximately 50% were suspected to be everolimus-related. Grade 3 stomatitis (aphthous stomatitis and mouth ulcer) occurred in two patients; both were suspected to be related to study medication. Grade 3 diabetes mellitus, increased levels of γ-glutamyl transpeptidase, dyspnoea, nasopharyngitis and peripheral oedema (mostly considered related to the study drug) were reported in one patient each. There were no deaths. Stomatitis and headache were the most common adverse events; other common adverse events were peripheral oedema, diarrhoea, nausea, cough, oropharyngeal pain and fatigue (table 2). Most adverse events were experienced at the highest dose level. Five patients withdrew from the study due to six nonserious adverse events, all while on the 10-mg dose (fig. 1, table 2). Respiratory, thoracic, and mediastinal disorders reported as adverse events were common (reported in 18 (75%) patients). Although there were no reports coded by investigators as pneumonitis, and no evidence of such based on spirometry, one patient discontinued the study at 6 months due to a lung disorder characterised by bilateral interstitial lung changes on HRCT scan. This event was considered by the investigator to be treatment-related (grade 2). The patient had no evidence of interstitial change as assessed by chest radiograph at week 14, and her FVC remained stable during the 6-month time period. She was treated with oral antimicrobial therapy and did not continue into the extension phase of the study. Interstitial lung findings from radiograph or HRCT were noted by a blinded radiologist in a total of 12 patients; three patients had changes on HCRT at month 6 indicating worsening from baseline, and one patient had evidence of worsening on the chest radiograph but no change on HRCT. The remaining patients exhibited no change (n=4) or improvement (n=3). A total of 12 serious adverse events were reported in eight patients; four of the serious adverse events (peripheral oedema, pneumonia, cardiac failure and Pneumocystis jirovecii infection) were suspected to be related to study drug. A 63-year-old female presented to the hospital with chylous pleurisy and dyspnoea 309 days after starting study medication. She was diagnosed with a pulmonary infection secondary to P. jirovecii and treated successfully with oxygen and antimicrobial treatment. She was noted to have a CD4 lymphopenia, and immunosuppression was considered a contributory factor. Study medication was stopped after she completed 38 weeks of treatment. The event was considered to be CTC grade 3 and related to study drug. A 69-year-old female with a past medical history of chronic obstructive pulmonary disease, obesity, hypertension and glucose intolerance was hospitalised with acute viral pericarditis 292 days (week 42) after starting study medication. She was reported to have had bronchitis for 13 days prior to hospitalisation, and tachycardia, atrial fibrillation and bilateral leg oedema within 5 days before hospitalisation. An echocardiogram showed a pulmonary artery pressure of 40 mmHg and chest radiograph was consistent with heart failure. She improved after antiarrhythmic therapy along with antibiotics, diuretics, insulin therapy and heparin. All events were considered to be grade 2; only the cardiac failure was thought to be related to study medication. She remained in the study until week 62. Overall, median laboratory values were stable over time. Figure 5a and b shows the median creatinine and cholesterol levels over time. All patients had at least one laboratory result outside of the normal range at some point during the study and most had elevations in serum cholesterol. 18 (75%) patients had elevations in serum cholesterol at some point during treatment; nine of these patients had elevations at screening and/or at baseline. 10 patients had ≥1 clinically significant change in laboratory variables that were reported as adverse events, including two patients with hypercholesterolaemia (cholesterol 7.14−9.68 mmol·L−1 and 5.25−6.47 mmol·L−1), two patients with hypertriglyceridaemia (triglycerides 1.81–5.43 mmol·L−1 and 1.76–7.61 mmol·L−1), and one patient with anaemia (haemoglobin 94−117 g·L−1). One patient experienced trace protein in urine at week 6 while receiving everolimus 10 mg; by the end of the study this had gradually progressed to 2+ (grade 1) on a urine dipstick test. The patient had a dose adjustment and/or interruption, but the proteinuria had not resolved by the time of study completion. There were no clinically relevant changes in vital signs and no consistent clinically relevant differences in ECG parameters, including QT interval or heart rate. Median blood levels of a) creatinine and b) total cholesterol during the course of the study with everolimus. BAS: baseline; EOS: end of study. The pharmacokinetics analysis set consisted of 16 patients; eight patients were unevaluable because plasma was collected instead of whole blood (the matrix for drug concentration measurement). Everolimus exposure increased in a dose-proportional manner: mean±sd predose blood concentrations were 3.1±1.33, 5.8±3.02 and 11.0±3.45 ng·mL−1 and 2-h postdose blood concentrations were 12.1±3.56, 22.6±7.22 and 45.7±12.52 ng·mL−1 at everolimus doses of 2.5, 5 and 10 mg·day−1, respectively. Everolimus treatment was associated with stability of FVC and improvement in FEV1, relative to baseline. Improvements in lung function continued during the extension phase (up to 60 weeks of treatment and potentially beyond). This durable improvement may reflect potential benefits with prolonged treatment duration or may have been an artefact of the disproportionate withdrawal of nonresponders. The effect of everolimus treatment on FEV1 (improvements of 114 mL at week 26 with improvements up to 150 mL at week 50) compared favourably with the minimally clinical important change of 100−120 mL observed with bronchodilators reported in chronic obstructive pulmonary disease . Together, the greater effect on FEV1 relative to the effects on FVC would tend to support a reduction in airflow obstruction. We also observed a trend toward improvement in exercise capacity, with a 47-m mean increase in 6-MWD (a 23.3% increase from baseline), albeit with considerable variability. A reduction in VEGF-D serum levels was observed throughout the treatment period, with most of the reduction occurring within the first 2 months of everolimus and a slower rate of change between weeks 8 and 26 (fig. 3). These early treatment pharmacokinetics data may be useful for planning VEGF-D-driven biomarker trials in the future. Collagen IV levels decreased and osteopontin levels increased with everolimus treatment, but there was no correlation observed between collagen IV levels and measures of lung function. Dose-proportional increases in everolimus exposure were observed, with blood concentrations similar to those in patients receiving these dose regimens for other everolimus therapeutic indications , indicating that everolimus-treated patients with LAM do not exhibit disease-specific pharmacokinetics alterations. There were 12 serious adverse events in eight patients, including four that were felt to be related to study drug (peripheral oedema, pneumonia, cardiac failure and pneumocystis infection), and one that resulted in withdrawal (peripheral oedema). There were five withdrawals due to nonserious adverse events, including menometrorhaggia, hypophosphataemia, diffuse interstitial changes on CT, noncardiac chest pain and increased oxygen requirement, and elevated liver function tests. Most remaining adverse events (mouth ulceration, fatigue) were consistent with the known tolerability profile of everolimus. The high rate of withdrawal due to adverse events may have been related to the relatively high dose of everolimus used in this study; all of the adverse events leading to study discontinuation occurred while on the highest dose (10 mg) of everolimus. Studies utilising lower doses may be warranted to minimise adverse effects in this population. Several adverse events encountered warrant additional discussion. One patient experienced an unexpected serious adverse event of P. jirovecii infection that was suspected to be related to everolimus and resolved after treatment. This raises the question of whether antibiotic prophylaxis should be considered in patients treated with mTOR inhibitors, particularly at higher doses. One patient withdrew with diffuse infiltrates consistent with pneumonitis. Four patients had evidence of worsening interstitial lung findings on CT, which may have indicated subclinical pneumonitis. Pneumonitis has been noted as a common adverse effect in mTOR trials in patients with hormone receptor–positive advanced breast cancer, renal cell carcinoma and pancreatic neuroendocrine tumours [32–35]. Pulmonary drug-related toxicities, due to mTOR inhibitors, can be fatal with continued exposure but can often be tempered by dose de-escalation or withdrawal. One patient experienced a serious adverse event of cardiac failure that was suspected to be related to study medication. This event resolved after treatment and the patient continued on everolimus for 20 more weeks of study. Cardiac failure is not a known side effect of mTOR inhibitors, and has not been reported in other mTOR trials [28, 32, 34–39]. The adverse event profile of everolimus in our study appears broadly similar to that of sirolimus in the MILES study . The most commonly occurring adverse events with sirolimus in the MILES study were gastrointestinal events, pain, dermatologic problems, and pulmonary or upper respiratory tract events. However, the number of pulmonary or upper respiratory events was higher in the placebo group than in the sirolimus group during the treatment period (121 versus 97 events). Serious adverse pulmonary events were also more frequent in the placebo group compared with the sirolimus group during treatment (13 versus 2, p<0.001). Five serious cardiac events occurred in three patients during sirolimus treatment, including pericarditis, atrial arrhythmia, tachycardia, and fluid overload following embolisation. Two patients in our study experienced a total of three serious cardiac events (cardiac failure, tachycardia, and pericarditis). There were no cases of pneumonitis, pneumocystis infection or heart failure on sirolimus in MILES. The results of our study provide initial evidence of the effectiveness of everolimus in patients with LAM and appear to be generally comparable with those of other mTOR inhibitors. 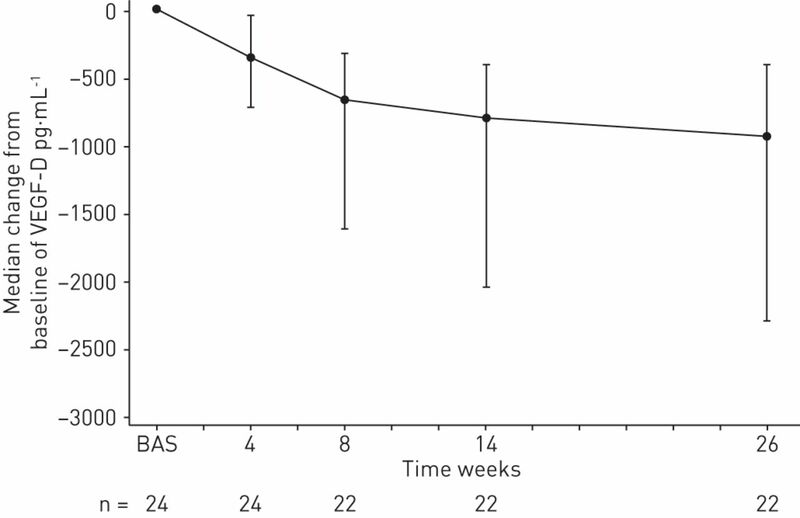 The randomised, placebo-controlled MILES study (N=89) demonstrated stabilisation of lung function with sirolimus , a decrease in serum levels of VEGF-D, and improved symptoms and QOL . Because of similarities between our study and the MILES study, a decision was made to compare the 26-week (6-month) efficacy data in our trial (change from baseline in FVC and FEV1) with the 6-month data in the placebo-controlled group from the MILES study (see Supplemental Methods). 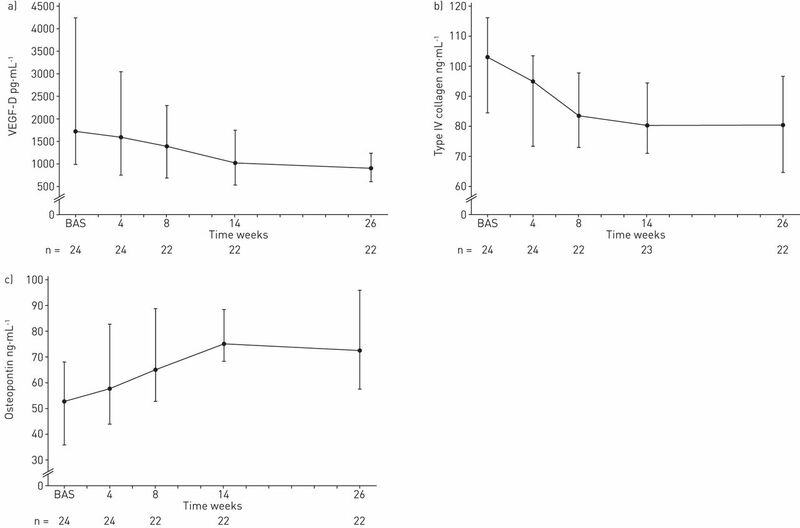 At 26 weeks, a 186 mL placebo-corrected improvement in FEV1 was observed in our study. This is slightly larger than the absolute difference of 153 mL seen between sirolimus and placebo in the MILES study; however, the placebo-corrected improvement in FVC was lower than that seen in the MILES study (76 versus 230 mL) (Supplemental Table 1). Importantly, there were differences between the patient populations of the two studies. Mean patient age in our study was similar to that of the MILES placebo group (44 versus 46 years), but the distribution of patient race differed, with more Asian patients in the MILES placebo group (0% versus 28%) . Also, disease severity was not as great in our study as in MILES (baseline FEV1 1.67 versus 1.38 L), which may have affected the rate of decline in FEV1 and the placebo-corrected comparisons. The effect of baseline FEV1 on rate of decline is currently unclear; one study showed that patients with higher baseline FEV1 values had a slower rate of FEV1 decline than those with lower baseline FEV1 values , but others found no correlation [2, 21]. No inferential analysis could be conducted comparing MILES VEGF-D data with data from our study, but baseline VEGF-D levels ≥800 pg·mL−1 were an optional eligibility pathway for both studies, and mean baseline VEGF-D levels were similar (2870 versus 2223 pg·mL−1) . The lack of a correlation between changes in VEGF-D levels and lung function after 26 weeks in our study is consistent with data from MILES, which showed a positive correlation after 12 months of sirolimus but no correlation between baseline to 6-month change in VEGF-D level and baseline to 12-month change in FEV1 . Several other studies of mTOR inhibitor treatment of LAM have been published. An observational study in 19 patients with LAM or chylous effusions showed stabilisation of lung function and reduction in chylous effusions and lymphangioleiomyoma size with sirolimus . A subsequent longer-term analysis of observational data from 38 patients with LAM with or without TSC reported that lung function stabilised during approximately 3.5 years of treatment with sirolimus, as demonstrated by slowing the decline of FEV1 and DLCO . Additionally, a small retrospective study in 15 patients with LAM demonstrated that low-dose sirolimus improved lung function and chylous effusion , and an open-label trial in individuals with angiomyolipoma and LAM demonstrated significant improvements from baseline in FVC and FEV1 in women treated with sirolimus for 12 months, with no changes in 6-MWD or DLCO . Positive though less impressive results were also reported for sirolimus in a second small series of patients, with shrinkage of angiomyolipomas observed but no clear improvement in lung function, although the number of patients available for analysis of pulmonary endpoints was small [27, 43]. In general, the adverse events reported in these studies and case reports of sirolimus were in line with those reported in the MILES study . A limitation of our study is the open-label, single-arm design. However, the decision not to include a placebo arm was, in our opinion, appropriate given the subsequent results of the MILES study. The marked benefits of sirolimus compared with placebo  highlight the ethical difficulties often encountered when designing trials in orphan lung diseases such as LAM . Although dosing of everolimus was not individualised, mean trough levels obtained were within the usual specified range of 5−15 ng·mL−1 at all dose levels studied. Even at the highest dose level of everolimus (10 mg), the mean trough level at steady state was 11.0 ng·mL−1. Everolimus has a shorter half-life (30 h versus ∼62 h) and increased bioavailability (∼30% versus ∼15%) compared with sirolimus . The short half-life makes everolimus a potentially attractive option for patients with LAM who are listed for lung transplant, because the drug exposure terminates more rapidly than sirolimus when the drug is stopped for the procedure. It is important to note that because of occurrences of bronchial anastomotic dehiscence in lung transplant patients, the FDA has placed a black box warning on the use of sirolimus as an immunosuppressive agent in the immediate post-transplant period. Although everolimus does not have an indication in lung transplantation, wound-healing defects are a class effect and the same concerns likely apply. The dosing range in the current study was based on those used safely in oncology studies. Because LAM is a nonmalignant, slowly progressive neoplastic disease, dosing ranges required may differ substantially from those used in cancer treatment. The dosing regimen in our study was determined prior to the MILES study and before additional data had been published. It has been suggested that lower doses of mTOR inhibitors may be effective in this patient population [25, 42, 46]. The optimal use and appropriate dosing of everolimus in the treatment of LAM requires additional investigation. Everolimus treatment in patients with sporadic or TSC-associated LAM was associated with an improvement in some measures of lung function and exercise capacity (FEV1 and 6-MWD), stability of FVC, and a reduction in serum levels of VEGF-D and collagen IV. Adverse events were consistent with the known toxicity profile of mTORC1 inhibitors. The authors would like to thank the following collaborators for their help during the study: Jean-François Cordier, Chahéra Khouatra, Romain Lazor, Grégoire Prévot, the French LAM association (FLAM), and the Centre d'Investigation Clinique des HCL (France). We would also like to thank the LAM Foundation for assistance with recruitment in the United States. Medical writing and editorial assistance in the preparation of this manuscript was provided by Andrea Bothwell and Traci Stuve of ApotheCom with funding provided by Novartis. Clinical trial: This study is registered at ClinicalTrials.gov with identifier number NCT01059318. Support statement: This study was sponsored by Novartis. Funding information for this article has been deposited with FundRef. Comprehensive evaluation of 35 patients with lymphangioleiomyomatosis. Chest 1999; 115: 1041–1052.
. Decline in lung function in lymphangioleiomyomatosis: relation to menopause and progesterone treatment. Am J Respir Crit Care Med 1999; 160: 628–633. Pulmonary lymphangioleiomyomatosis. A study of 69 patients. Groupe d'Etudes et de Recherche sur les Maladies "Orphelines" Pulmonaires (GERM"O"P). Medicine (Baltimore) 1999; 78: 321–337.
. Clinical experience of lymphangioleiomyomatosis in the UK. Thorax 2000; 55: 1052–1057. Decline in lung function in patients with lymphangioleiomyomatosis treated with or without progesterone. Chest 2004; 126: 1867–1874. The NHLBI lymphangioleiomyomatosis registry: characteristics of 230 patients at enrollment. Am J Respir Crit Care Med 2006; 173: 105–111.
. High frequency of pulmonary lymphangioleiomyomatosis in women with tuberous sclerosis complex. Mayo Clin Proc 2000; 75: 591–594. Pulmonary lymphangioleiomyomatosis in a man. Am J Respir Crit Care Med 2000; 162: 749–752. Lymphangioleiomyomatosis. Clinical course in 32 patients. N Engl J Med 1990; 323: 1254–1260. Pulmonary lymphangioleiomyomatosis in a karyotypically normal man without tuberous sclerosis complex. Am J Respir Crit Care Med 2007; 176: 96–98.
. Mutations in the tuberous sclerosis complex gene TSC2 are a cause of sporadic pulmonary lymphangioleiomyomatosis. Proc Natl Acad Sci USA 2000; 97: 6085–6090. Lymphangioleiomyomatosis and TSC2-/- cells. Lymphat Res Biol 2010; 8: 59–69. Lymphangioleiomyomatosis (LAM): molecular insights lead to targeted therapies. Respir Med 2010; 104: Suppl. 1, S45–S58. Serum vascular endothelial growth factor-D levels in patients with lymphangioleiomyomatosis reflect lymphatic involvement. Chest 2009; 135: 1293–1300. Vascular endothelial growth factor-D is increased in serum of patients with lymphangioleiomyomatosis. Lymphat Res Biol 2006; 4: 143–152. Serum vascular endothelial growth factor-D prospectively distinguishes lymphangioleiomyomatosis from other diseases. Chest 2010; 138: 674–681. Serum VEGF-D concentration as a biomarker of lymphangioleiomyomatosis severity and treatment response: a prospective analysis of the Multicenter International Lymphangioleiomyomatosis Efficacy of Sirolimus (MILES) trial. Lancet Respir Med 2013; 1: 445–452.
. Lymphangioleiomyomatosis. Cancer Control 2006; 13: 276–285.
. Lymphangioleiomyomatosis: a clinical update. Chest 2008; 133: 507–516. Survival and disease progression in UK patients with lymphangioleiomyomatosis. Thorax 2004; 59: 800–803. Low initial KCO predicts rapid FEV1 decline in pulmonary lymphangioleiomyomatosis. Respir Med 2004; 98: 536–541. Decline in lung function in the Busselton Health Study: the effects of asthma and cigarette smoking. Am J Respir Crit Care Med 2005; 171: 109–114. A 2-year randomised placebo-controlled trial of doxycycline for lymphangioleiomyomatosis. Eur Respir J 2014; 43: 1114–1123. Effect of a gonadotrophin-releasing hormone analogue on lung function in lymphangioleiomyomatosis. Chest 2008; 133: 448–454. Efficacy and safety of sirolimus in lymphangioleiomyomatosis. N Engl J Med 2011; 364: 1595–1606. Sirolimus for angiomyolipoma in tuberous sclerosis complex or lymphangioleiomyomatosis. N Engl J Med 2008; 358: 140–151. Sirolimus therapy in tuberous sclerosis or sporadic lymphangioleiomyomatosis. N Engl J Med 2008; 358: 200–203. Everolimus for angiomyolipoma associated with tuberous sclerosis complex or sporadic lymphangioleiomyomatosis (EXIST-2): a multicentre, randomised, double-blind, placebo-controlled trial. Lancet 2013; 381: 817–824.
. Minimal clinically important differences in COPD lung function. COPD 2005; 2: 111–124. Burris HA III., et al. Phase I pharmacokinetic and pharmacodynamic study of the oral mammalian target of rapamycin inhibitor everolimus in patients with advanced solid tumors. J Clin Oncol 2008; 26: 1588–1595. Adverse event management in patients with advanced cancer receiving oral everolimus: focus on breast cancer. Ann Nutr Metab 2014; 25: 763–773. A randomized phase II study of everolimus for advanced pancreatic neuroendocrine tumors in Chinese patients. Med Oncol 2014; 31: 251–256. Safety and efficacy of everolimus with exemestane vs. exemestane alone in elderly patients with HER2-negative, hormone receptor-positive breast cancer in BOLERO-2. Clin Breast Cancer 2013; 13: 421–432. Phase 3 trial of everolimus for metastatic renal cell carcinoma: final results and analysis of prognostic factors. Cancer 2010; 116: 4256–4265. Everolimus for subependymal giant-cell astrocytomas in tuberous sclerosis. N Engl J Med 2010; 363: 1801–1811. Everolimus long-term safety and efficacy in subependymal giant-cell astrocytoma. Neurology 2013; 80: 574–580. Efficacy and safety of everolimus for subependymal giant cell astrocytomas associated with tuberous sclerosis complex (EXIST-1): a multicentre, randomised, placebo-controlled phase 3 trial. Lancet 2013; 381: 125–132. Everolimus for subependymal giant cell astrocytoma in patients with tuberous sclerosis complex: 2-year open-label extension of the randomised EXIST-1 study. Lancet Oncol 2014; 15: 1513–1520. Changes in lung function and chylous effusions in patients with lymphangioleiomyomatosis treated with sirolimus. Ann Intern Med 2011; 154: 797–805. Sustained effects of sirolimus on lung function and cystic lung lesions in lymphangioleiomyomatosis. Am J Respir Crit Care Med 2014; 190: 1273–1282. The efficacy and safety of low-dose sirolimus for treatment of lymphangioleiomyomatosis. Respir Invest 2013; 51: 175–183. Sirolimus therapy for angiomyolipoma in tuberous sclerosis and sporadic lymphangioleiomyomatosis: a phase 2 trial. Clin Cancer Res 2011; 17: 4071–4081.
. Rare lung disease and orphan drug development. Lancet Respir Med 2013; 1: 479–487.
. Inhibitors of the mammalian target of rapamycin. Exp Opin Invest Drugs 2005; 14: 313–328.
. Chronic sirolimus therapy for lymphangioleiomyomatosis. Am J Respir Crit Care Med 2014; 190: 1332–1333.